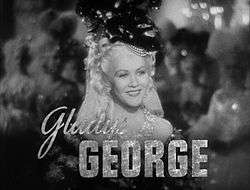 Gladys George (September 13, 1904 – December 8, 1954) was an American actress of stage and screen..
She was born as Gladys Clare Evans on September 13, 1904 in Patten, Maine (Another source says Hatton, Maine; a third source says "Gladys was born in a little town in Missouri, where the troupe her parents belonged to happened to be stranded at the time.") to English parents. Her father was Sir Arthur Claire, "noted Shakespearean actor." Valiant Is the Word for Carrie Carrie Snyder 1936 Nominated for the Academy Award for Best Actress. Only Academy Award for which Gladys George was ever nominated. They Gave Him a Gun Rose Duffy 1937 Co-starred with Spencer Tracy. Madame X Madame X/Jacqueline Fleuriot/Miss Pran 1937 Only film starring Gladys George to have been released on VHS. Marie Antoinette Madame du Barry 1938 First time Gladys George portrayed a historical figure. First supporting role since Oscar nomination. The Roaring Twenties Panama Smith 1939 Film contains one of the more substantial of Humphrey Bogart's early roles. 1 2 "Family Tree Legends". Retrieved December 1, 2014. lists Gladys Clare Evans born September 13, 1904, Maine - died December 8, 1954, Los Angeles, California. 1 2 "Gladys George Made Her Hit, Had to Run". New York, Brooklyn. The Brooklyn Daily Eagle. May 12, 1940. p. 47. Retrieved March 5, 2016 – via Newspapers.com. 1 2 Tildesley, Alice L. (November 8, 1936). "Are You a "Yes-Woman"?". West Virginia, Charleston. The Charleston Daily Mail. p. 76. Retrieved March 5, 2016 – via Newspapers.com. ↑ "Gladys George". Academy Awards. Retrieved 5 March 2016. ↑ "We found 141 results for "Gladys George"". Playbill. Retrieved 5 March 2016. ↑ Profile, imdb.com; accessed December 1, 2014. ↑ "Ben Erway, Oakland Actor, And Gladys George Are Wed". California, Oakland. Oakland Tribune. April 1, 1922. p. 4. Retrieved March 5, 2016 – via Newspapers.com. ↑ "Utah Actress Asks Divorce". Utah, Ogden. The Ogden Standard-Examiner. September 20, 1930. p. 1. Retrieved March 5, 2016 – via Newspapers.com. ↑ "Star Divorced". California, Oakland. Oakland Tribune. October 8, 1930. p. 1. Retrieved March 5, 2016 – via Newspapers.com. ↑ "Must Wait 3 Years to Wed in N.Y.". Wisconsin, Milwaukee. The Milwaukee Sentinel. August 27, 1935. p. 18. Retrieved 5 March 2016. ↑ "Gladys George Marries Actor Named in Suit". Utah, Salt Lake City. The Salt Lake Tribune. September 19, 1935. p. 4. Retrieved March 5, 2016 – via Newspapers.com. ↑ Profile, findagrave.com; accessed December 1, 2014. ↑ "Gladys George at Find a Grave". Retrieved December 1, 2014.